Quinoa has been steadily growing in popularity lately. I first encountered it a few years ago when it was served as a rice alternative at a restaurant specializing in organic home-cooked style meals. But it wasn’t until I read up about quinoa that I started to understand its appeal. When compared to rice or couscous, quinoa is a nutritional powerhouse. It is a complete protein source, and is high in fiber, phosphorus, magnesium, and iron. It has a bit of a nutty flavour and toothy texture. 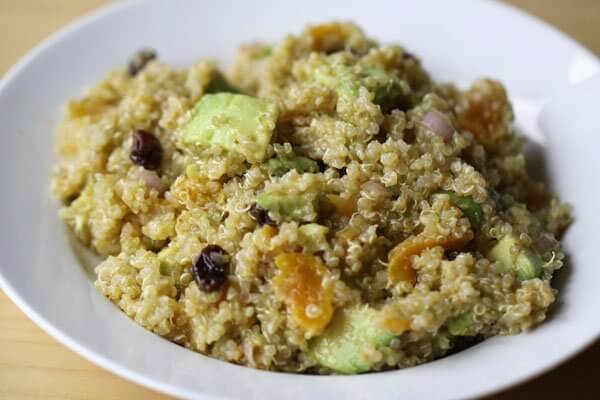 This quinoa and avocado is the perfect recipe for experimenting with quinoa… or if you are already a quinoa fan, you are sure to enjoy this recipe. The vinaigrette is flavoured with cumin, coriander and paprika (I used smoked paprika), which along with the raisins and dried apricots gives it a bit of a Northern African or Middle Eastern flavour. This salad makes a perfect light lunch. I recommend making a double batch, so you have leftovers for lunch tomorrow.